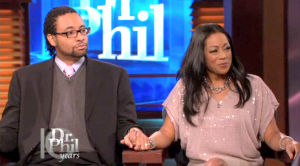 Married relationship coaches Kenya and Carl Stevens, who were profiled briefly in an opinion piece in the February issue of Ebony magazine, were the subjects of a recent epside of Dr. Phil. Unfortunately, the couple are handled with the same dramatic, in-your-face tone that Dr. Phil is known for. The full show can't be found online, but several clips and a write-up of the appearance are available on Dr. Phil's website. The write-up includes many quotes from the show, in which Carl and Kenya explain how opening up their marriage has enriched their lives. "When my husband and I went from monogamous marriage to open marriage, everything changed," Kenya says. "I felt like I came out of hiding. My husband came alive. I came alive."
. . . "We practice progressive love," Carl tells Dr. Phil. "It's not just open marriage. Open marriage is a relationship style. It's like monogamy or polygamy, whatever. So, we practice progressive love, and what that means is we're allowed to show up authentically with each other, that we trust each other, and we love each other unconditionally." Some clips from the show can be found on the pages of the write-up. Kenya wrote about her experience on the show on her blog.